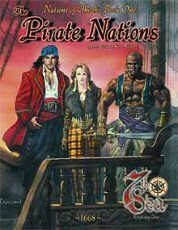 "Swashbuckling and Sorcery * Piracy and Exploration * Espionage and Intrigue * Welcome to the New World * 7th Sea is a game of action and high adventure in a world of musketeers, pirates, secret societies and political intrigue. Players take the roles of heroes bent o­n thwarting the plots of knaves and villains, exploring ancient ruins and plundering the treasure fleets of tyrants. Everything a player needs is included in the pages of this book. • Easy to get started: The book opens with a Quick Start Guide so you can start playing within minutes. • A Complete New World: Players will find almost o­ne hundred pages devoted to Theah, the world of 7th Sea. 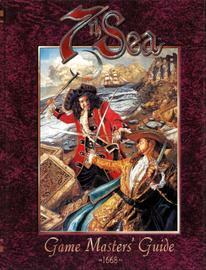 • Flexible rules: 7th Sea uses a unique bidding system, giving players and Game Masters control over the mechanics of the game. • Advice for Novice and Experienced Players: If you've never played a roleplaying game before, or if you're an 'old school' veteran, you'll find tons of hints and advice to help you act and interact within the world of 7th Sea." "Nefarious Villains * Precarious Plots * Breathtaking Cliffhangers * All in a day's work! 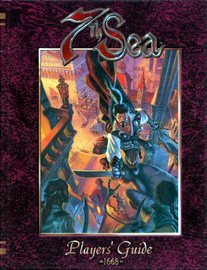 * 7th Sea is a game of action and high adventure in a world of musketeers, pirates, secret societies and political intrigue. Everything a Game Master needs is included in the pages of this book. • The Theah Sourcebook: Detailed essays and maps o­n Theah's nations, cultures, secret societies and the Vaticine Church. • Flexible rules: A vast supply of advanced and optional rules including mass combat, boarding actions and ship-to-ship skirmishes. Each rule is presented in a modular format so GMs can use o­nly what they like. • Advice: Tons of hints and tips, dozens of story hooks, how to make the most out of your villains, story building techniques, writing adventures, running action scenes, and much more! The indispensible guide for 7th Sea Game Masters." "This essential aid includes a three-panel, fold-out screen, helpful GM hints, and the first in a three-part adventure series. This module includes a fast-paced journey across main land Théah, with the player encountering action and intrigue at every turn. Also included is the first installment in the Explorer’s Society Source Book." "This compilation of rules, updates and player information contains details on every aspect of 7th Sea. 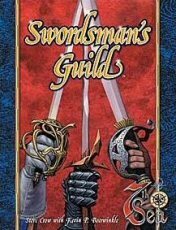 For new players, it provides an introductory guide to an exciting world of swordsmen and swashbucklers. For experienced players, it contains all the new material from the 7th Sea second printing, allowing you to stay caught up on everything. Whether you're a bright-eyed newbie or a grizzled veteran, a salty pirate or a gallant musketeer, this book has what you're looking for. • An updated history, expanded details on the Secret Societies, and new information on Objectionism and the Inquisition. • Expanded details on the mysterious Syrneth, including rules for creating your own artifacts. • A ship-building system, allowing your players to create new vessels for their Heroes. • A quick-start Hero creation guide, compiled lists of character abilities, pictures of the powerful Laerdom runes, and more!" "In the heart of the western seas lies an island like no other. There, the idle rich of Théah's mightiest nation hunt the most fearsome monsters the world has ever seen amidst the overgrown jungle trees. But while they play their dangerous games, someone lurks in the shadows. Someone who knows the island's true powers and plans to seize them for himself. Can your Heroes stop him in time? • A Complete Adventure: self-contained yet compatible with other chapters in the Erebus Cross series. • Stats: and descriptions for major NPCs. • Explorer's Secrets: Continuing coverage of the Explorer's Society, one of Théah's most intriguing secret societies." "In the midst of a dense swamp, in a corner of the most dangerous nation in Théah, lies a machine of unparalleled destruction. Designed by an ancient alien intelligence, it has the power to seize the stars themselves . . . or snuff out all life forever. Now, numerous factions - sinister and benevolent, cognizant and ignorant - converge on the site, hoping to seize its power for themselves. Your Heroes must stop them - before they unleash something they cannot control. 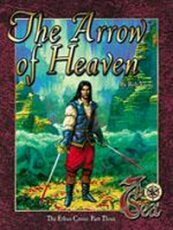 The Arrow of Heaven is the dramatic finale to the Erebus Cross series of adventures for the 7th Sea role-playing game. From the war-torn plains of Castille to the rickety heights of Vodacce's greatest city, it spans the length of southern Théah in an effort to stop a disaster. • Syrneth Secrets: New, previously undisclosed information on the mysterious Syrneth - and the races who fought them." • Footprint Island: An introductory treasure hunt adventure for novice and experienced players. • The Powder Keg: A unique tavern full of NPCs, adventure hooks, and seven different backgrounds to make it fit within any of Theah's nations. • How To Build the Perfect Villain: An essay on building exciting, convincing, unique and balanced bad guys (and gals) for your 7th Sea games. • Four New Action Maps: Leveled and ready for swashbuckling action, Players can fight their way through a Theatre, a Stable and Coach House, a Vaticine Chapel and the Powder Keg Tavern. • Sixteen NPC head shots: Great visual aids for your game; develop these characters however you wish. • Campaign Construction Sheet: Design, organize and keep track of your adventures." "Five years ago, Eisenfürst Nicklaus Trägue established a new kind of city: one free of government, laws, and oppression; one where everyone was welcome. 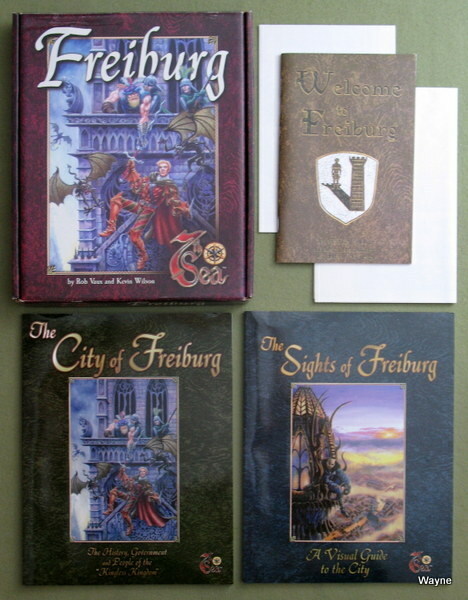 Freiburg has since become a haven for the desperate and ambitious: built on the remains of a drachen graveyard, sprawling beneath an alien watchtower, it seethes with untold corruption and countless opportunities..."
• An extensive layout of the city, including important locations, NPCs and encounter charts. • A complete discussion of Freiburg's laws, government, and society, including new information about Eisenfürst Trägue and detailed history of the area from the time of the Drachen to the present day. • "Hammer and Tongs", a complete campaign set within Théah's most dangerous city. • A beautiful fold-out map of central Freiburg." "Every swashbuckler has a fine blade to depend on, but wise men know of far deadlier weapons — those written on parchment with quills of ink. Writing can unleash floodgates of emotion, start a revolution, or inspire a nation to feats undreamed of. In the two adventures contained in these pages, they can do much, much more. In 'Music of the Spheres,' Charouse is alive with excitement about l'Empereur's latest protege — a young musical phenomenon who has charmed the Montaigne nobility with her grace and talent. 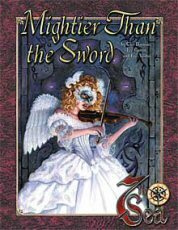 A lavish masquerade ball is thrown to honor her, but something goes badly astray... and danger waits for the band of Heroes who seek to put things right. Unknown perils lurk beneath die gilded surface of the Sun King's golden city, a mysterious artifact hold dark secrets within its haunting melody, and an ancient evil must be vanquished to rescue a very special damsel in distress. Can your Heroes save the day and avoid the wrath of the most powerful man in Theah? In 'The Golden Head of Korlak ur-Nagath,' the danger comes from a much baser source — the tawdry novels of an overblown hack. But within his cliched romances lurks a map to a fabulous treasure. It's over nine feet tall. It's made of solid gold. It may just be the most valuable artifact in all of Theah. And your Heroes know where it is. 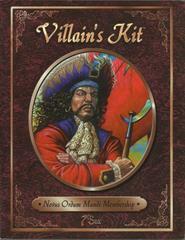 Unfortunately, so does the most wretched collection of rogues, scoundrels, and villains ever to sail the seas. The question is not only whether you can get to it first, but how you're going to to keep it. In a raucous race like this one, nothing is taken for granted. 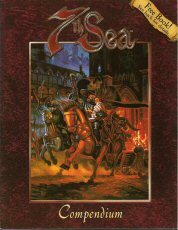 Mightier Than the Sword contains two complete adventures for the 7th Sea role-playing game, complete with detailed NPCs and optional challenges to be inserted as desired. It requires the 7th Sea Players' Guide and GMs' Guide for play. 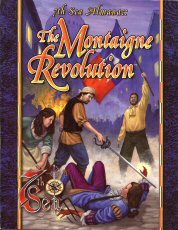 Copies of the Montaigne and Pirate Nations sourcebooks are recommended, but not required." "What Webs We Weave... In a dark corner of Vodacce lurks a criminal mastermind known as the Scarred Man. Through strength, fear, and dark Sorte magic, he has carved out a comfortable empire for himself. But the threads of his destiny extend further than he knows, leading to a pair of heroic innocents who hold the key to his demise. Helena and Ramon, lovers, fugitives, and Castillian patriots, have deep ties to the scoundrel's past. Unless your Heroes can help them, he'll see to it that they have no future. From the fields of Castille to the alleyways of Porto Spatia, the tangled threads lead into the heart of true love, thwarted ambition, and a most disagreeable foe. 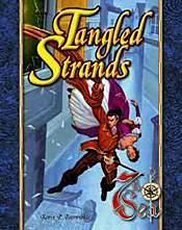 Tangled Strands is a multi-part adventure set in the world of 7th Sea. It is intended to be run in several stages over the course of a campaign, and contains scenario descriptions, character run-downs, maps, and complete rules for your convenience. It requires the 7th Sea Player's Guide and GMs' Guide for play. 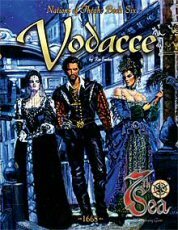 Copies of the Castille and Vodacce sourcebooks are recommended, but not required." "The waters surrounding Theah are as deadly as her mainland, where brutal pirates and mighty navies battle for supremacy. Some fight for plunder and glory, while others seek to push the boundaries of human exploration. A sailor's life contains untold freedoms — and perils to chill the soul. The adventure of a lifetime is waiting just beyond the next cove, ready to make you fabulously rich... or send you straight to the bottom. Dangerous men and women ply the waterways, from the driven Explorer Guy McCormick to the indomitable "Bloody" Bonnie McGee. Only the strongest dare cross swords with them, but the rewards are well worth the risks. Now, for the first time, their stories have been gathered into a single volume. Waves of Blood contains the complete background for the 7th Sea CCG, as well as a host of information for players and Game Masters alike. Journey with the Brotherhood of the Coast, battle Admiral Valoix alongside the Castillian Armada, or cross swords with the murderous Crimson Rogers. Everything you need for endless evenings of adventure can be found within these pages. 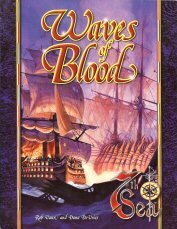 Join the ships and crews of the Thean seas, and set sail across the waves of blood. • A complete history of Theah's ten most powerful naval factions, with discussions on creating Heroes from their ranks and running campaigns based around their activities. • A wealth of new rules, including RPG/CCG conversion guidelines allowing you to create playable cards from your favorite RPG Heroes, and RPG characters from 7th Sea cards! • Stats and backgrounds for the card game's most popular figures, prominent artifacts complete with adventure hooks, and ten fully developed locations for your campaign. • A thorough run-down of the CCG storyline from No Quarter! to Horizon's Edge. • A 24-page color section featuring a timeline for the card game story, a two-page map, and beautiful full-color images from some of the industry's best artists. • Rules and history for the mysterious Island of the Sunken Eye and the Syrneth secrets it holds within its depths. • For the first time, a complete discussion of the unholy Black Freighter, including ways to use it in your campaign!" 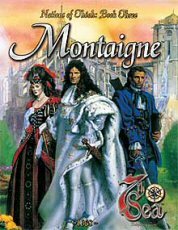 "For too long, the peasants of Montaigne have suffered under the decadent oppression of the nobility. In a wave of righteous fury, they rise up against their corpulent Empereur, destroying his order in the blink of an eye, Porte blood runs red in the street as the most powerful nation in the world turns upside down. But what sort of leaders can replace a deposed tyrant? And will their order be any better than the old? In the depths of the Mirror, an ancient island rises, heralding the beginning of a new age of discovery. The Explorers' Society launches a bold new movement into the western seas, convinced that strange lands lie beyond the setting sun. They are soon joined by a host of sailors and scoundrels, minions of Thean crowns, and pirates searching for prey. But what sort of dangers await them all across the horizon? And what unknown threats will their efforts unleash? In the halls of Vodacce, the Great Game enters a deadly new phase, while the Iron Princes of Eisen launch plots for power and strength. Vendel and Vestenmannavnjar continue their growing feud as hidden secret societies struggle to react to history in the making. "From the forests of Avalon to the steppes of Ussura, Theah moves forward and fate's hand strikes the innocent and guilty alike. * A detailed update of Theah's turbulent recent history, from the rise of Cabora to the fall of l'Empereur. Campaign guidelines are included to place your Heroes in the middle of the action. * New information on all of Theah's nations and the changes wrought in the past year. * Revised stats and backgrounds for the most important NPCs. * Complete details on a new secret society, the Rye Grin, and their daring efforts to rescue the innocent victims of the Revolution. 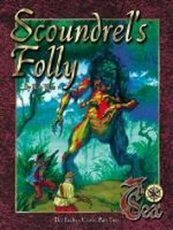 * A host of adventure hooks, GM's secrets, and more!" • Details on the Guild's most important NPCs, from the stalwart Miles Donovan to the deadly Linnae Knute. • Rules and guidelines for conducting duels, including Reputation effects and ways to spin such conflicts into larger adventures. • Nine completely new Swordsman Schools, approved by the Guild and ready to play!" For centuries, the Empire of the Crescent Moon has remained isolated from the rest of Théah — barred by cultural barriers and a fearsome embargo by the Vaticine Church. Only a select few have journeyed beyond her borders… but they have seen wonders which put the rest of the world to shame. From fierce desert tribesmen to the cultured city merchants, from the gardens of the Sultán to the forbidden slopes of Mt. Karada, from the clandestine Eyes of the Peacock to the ruthless Qathl’i assassins, the Crescent Empire holds enough marvels — and terrors — to fill a thousand lifetimes. 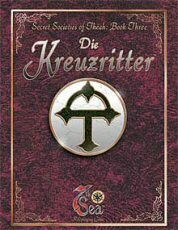 Journey with die Kreuzritter to protect ancient Syrneth ruins. Match wits with the canny warriors of the Sultán’s guard. Seek hidden scrolls in the libraries of Iskandar and play ajedrez with the tribal chieftains of Maglak’kum. A thousand years of isolation are coming to an end. The Crescent Empire awaits. 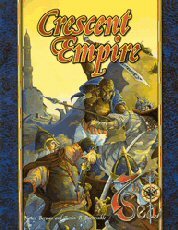 • A complete history of the Empire, including its clashes with western Theah and the recent rise of Cabora. • New rules for Crescent sorcery, allowing its practitioners to command the sands themselves. • Numerous Crescent swordsman schools, from the sensuous Yael to the terrifying Daphan. • Details on the Qathl’i, fearsome, killers who have slain Sultán and slave alike. • Thorough coverage of the rich Crescent culture, from their renowned schools of learning to their implacable fighting skills. • New rules, skills, backgrounds, and expanded details for Crescent Heroes. • Coverage of the Empire’s most important figures, Heroes, and Villains alike. • Complete rules for the ancient game of ajedrez and more!" "No men are as free as the sons of the sea. The pirates of Théah are not bound by nationality or religion, only a desire for adventure… and profit. Théah’s kings and queens may rule the land, but freedom rules the waves. • New rules for Hero creation, fighting schools, boarding actions, Advanced Sailing and more!" "There is a land where the heroes of legend never died. Where magic permeates the very soil of the ground. Where eldritch creatures stalk the countryside, and where three kingdoms emerged from six centuries of bloodshed to challenge the greatest powers in Théah. 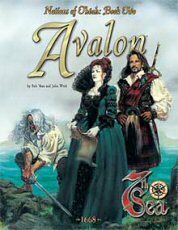 Welcome to Avalon, where your fondest dreams - and worst nightmares - come true. • Information on the three nations that compromise the Glamour Isles, complete with history, background information, and prominent personalities. • An extensive discussion on the enigmatic Sidhe, including a system for creating Sidhe Heroes. • A wealth of new rules: fighting schools, new Glamour Knacks, Druid magic, and the elite order of Elain's Knights. • Descriptions of the Isles' most terrifying monsters, a two-page map of the Avalon capital, and more!" "This is truly a golden age. Montaigne stands on top of the world, and no one can challenge her authority. The limitless gold that pours from the Empereur’s coffers fuels the war against Castille — a war which can only end in victory for Montaigne, and the destruction of the Empereur’s most bitter enemy, the Church itself. Beneath the surface, however, dark forces have begun to stir, and the voices of a thousand spirits cry out for vengeance! • Information on the fifteen provinces of the Empire of the Sun King, complete with history, background information, and prominent personalities. • Tips on playing the most dangerous game of them all — courtly intrigue. • A wealth of new rules: fighting schools, new uses for Porté, Montaigne Puzzle Swords, and L’Empereur’s Musketeers. • Descriptions of the native ghosts and spectres, a two-page map of the Montaigne capital, and more!" 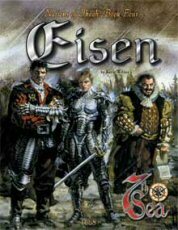 "Once the mightiest military power in Theah, Eisen has been decimated by the thirty-year War of the Cross, leaving the survivors behind to pick up the pieces and bury the dead. Disease and famine continue to ravage the countryside, while the divided Iron Princes argue among themselves. Worse yet, the death of so many has attracted the attention of horrors thought destroyed centuries ago. Eisen desperately needs a hero — someone capable of reuniting the nation before it's too late. • Information on the seven knigreichen of the Iron Princes, complete with history, background information, and prominent personalities. • Advanced rules for Eisen's favorite pastime — war. Nibelungen, a secretive order of dracheneisen smiths. • Descriptions of some of the deadliest creatures in all of Theah: the Schattenmann, the mighty drachen, and more." "From her vaulted universities to her spired churches, Castille is a land of contradictions. Scientific advancement proceeds despite the efforts of an Inquisition dedicated to stamping it out. Celebrations take place mere miles from blood-soaked battlefields. The citizens love their neighbors as family, while treating foreigners with clinical distrust. Here, two thousand years of invasion and occupation has left her people wounded, proud, and fiercely independent; a boy king totters on an unstable throne while enemies surround him without and within; and sinister conspiracies lurk behind wide smiles and passionate speeches. Welcome to Castille, the crucible of faith. • A complete history of the country, from their early days as an Old Republic colony to the current war with Montaigne. • Detailed descriptions of the land, its people and their culture — including bullfighting, dancing, and Castillian duels. • New rules for Castillian Heroes: fighting schools, rules for bullwhips, new skills and advantages, and the enigmatic fire magic El Fuego Adentro. • Plus, a section on the Vaticine Church, with new information never before published!" "Vodacce is a lady who hides her steel claws within a velvet glove. Her daughters, mistresses of destiny and weavers of the future, direct their subtle manipulations beneath the notice of the seven merchant Princes hide their power behind veils and webs. Within her borders lies the ancient city of Numa, a rotting husk within the trappings of the Vaticine Church, surrounded by lost relics of a former age. Gently rising from arched spires and impossible towers, the islands of the Princes maintain complete power over its mainland, controlling their noble families with an iron grasp. Courtesans, beautiful and glittering, dance for the nobility behind jeweled masks white dark shadows conceal Fate Witches and their skeins. While the men war for control of Vodacce's wealth and power, the women fight a battle of a different sort — against the very destiny they seek to control. The most dangerous country in Theah hides behind a pleasing smile. • A complete history or the country, from the early days within the Empire of Numa to the present, and complete descriptions of the seven Princes and their noble families. • Detailed descriptions of the land, its people and their culture — including the life of a courtesan, the Vodacce ideal of honor, and backgrounds for those who choose to serve the Seven Princes. • New rules for Vodacce Heroes: family backgrounds, fighting schools, Sorte abilities, new skills and advantages, and a unique courtesan's fighting style. • A special section on women in Vodacce, from the Fate Witches and courtesans to the Senzavista, women born into the nobility without the gifts of Sorts." "Primal forests cover mile after mile of landscape, stretching through barren plains and snow-swept mountains. 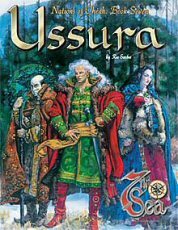 The country of Ussura is a raging bear, ruled by a white-haired beast and guarded by pacts of blood. Her church defies the Vaticine, and her people call for strength from an ancient goddess deep within their shifting lands. Uncounted legends lie within her borders, hidden beneath ice and snow. She has many secrets – ancient ruins undisturbed since the dawn of time, walls of fire that tower over a man’s head, and animals that race through the night laughing at the simpleness of man. Ussura is untamed, but she is not unaware. She dares to educate her peasants, commands no standing army, and relies on the tremendous power of Matushka, an immortal being that defies definition and fiercely protects the nation she calls home. The Vaticine cannot control her. Where will you stand when the snows fall? • A lengthy history of the country, as well as the five ancestral kingdoms which comprise her borders. • Complete descriptions of the land, its people, and their culture, from the wild horsemen of the east to the fierce guerrilla fighters of the west. • New details on Matushka, the tragic tale of Gaius Ilya, and comprehensive information on the Ussuran Orthodox church. • New rules for Ussuran Heroes: unique skills and abilities, an axeman’s fighting school, and expanded details on the shape-shifting magic of Pyeryem. • Rules and background for the Fhideli, Ussuran gypsies who call no man their master." "Two hundred years ago, the islands of Vestenmannavnjar were home to fierce warrior tribes. Wielding powerful rune sorcery and deadly steel, their warriors struck terror into the hearts of Théans everywhere. All that has changed. Vendel, as it now calls itself, has broken from its past and forged a new future. Today, bankers and merchants rule the country, and swords and longboats have been replaced by guilders and trading ships. The streets are clean and modern, the people stand at the forefront of Théan achievement. From what was once a savage, wild land now stands the most powerful economic power in the world. But all is not well in this brave new nation. Traditional Vestenmannavnjar still adhere to the old ways, wielding fierce magic in defense of their homes. They call upon the Vendel to abandon their modern advances, while the Vendel sneer as their 'backwards' cousins edge closer to extinction. The tensions between them threaten to tear the nation apart and unleash an apocalypse that will consume them all. Whether axes or guilders, their weapons are the strongest in Théah. But will they destroy each other before they realize such power? • A lengthy history of the country, including the legendary heroes of its past. • Complete descriptions of both Vendel and Vestenmannavnjar culture, plus a thorough discussion of the nine islands which comprise their home. • New details on the Living Runes and the Lærdom sorcery school which they engendered, as well as extended information on the powerful Vendel Merchant Guilds. 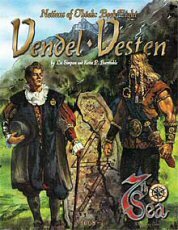 • New rules for Vendel and Vestenmannavnjar Heroes: unique skills and abilities, expanded merchant rules, four new fighting schools, and a new type of Destiny Spread utilizing both Vestenmannavnjar rule casting and Vendel astrology." "From time immemorial, the Order of the Rose and Cross has protected the innocent, defended the helpless, and brought justice to the wicked. Beloved by all, patronized by kings and commoners alike, they represent the best of the human spirit. But hidden secrets lie behind their noble seal — secrets that could shatter Theah if they became known. 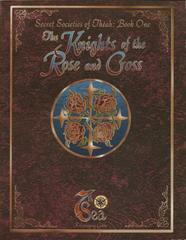 Don the tabard of the Rose and Cross, and learn what Thean honor truly means. • A detailed history and background of this ancient sect. • The knowledge at the heart of the order which the Knights keep hidden from all — even their own members. • Expanded rules for creating your own Knights, including new Advantages, a new Swordsman school, and guides on creating your own chapterhouses. • A complete adventure with a new chase map." "In the shadows of Théah lurks a strange and unique conspiracy — men and women who refuse to accept the status quo, who challenge authority in all its forms, and who fight to free humanity from its self-imposed limitations. 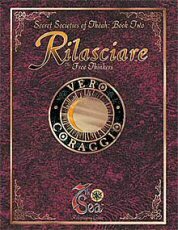 Whether with pamphlets on the street or bombs beneath buildings, the Rilasciare battles for a golden future only it can see. Some call them heroes. Others believe they should be hunted down like animals. But their hidden crusade has rocked Théah to its very core. They will throw the light of truth on the closed minds of their fellow man… by any means necessary. • A detailed history of one of Théah’s most unusual organizations, from the streets of the Old Empire to the darkest corners of modern Théah. • Information on the Free Thinkers’ various factions — scholars, witch hunters and bomb-throwers — as well as their secretive means of communication. • Expanded rules for creating Rilasciare Heroes, including new Advantages, expanded explosives rules, and the dreaded Zerstörung Sorcery school." "In 1411, the Order of the Black Cross was wiped out to a man. • A detailed history and background of the Black Crosses. • New Syrneth artifacts, new monsters, and a secret that could tear the world apart — why did the First Prophet condemn Sorcery? • New Advantages, a new Swordsman School, and a new form of Sorcery heretofore unseen." "The Inquisition has launched a war against learning. All across Theah, it hunts down scholars with ruthless abandon, burning and destroying anything it perceives as a threat. Decades of advancement have vanished in a single bonfire, while brilliant men and women are murdered in the night for daring to speak the truth. From a thousand hiding places, the Invisible College continues its forbidden studies. Separated by vast distances, ensconced in the deepest hiding places, its members continue the struggle for learning and enlightenment. From their experiments, Thean science advances. From their teachings, countless mysteries have been solved. From their courage and daring, the people understand the world around them... and learn that tyranny can be defied. 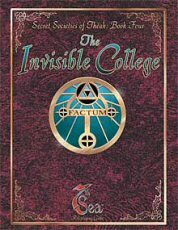 The Inquisitors believe they hold the keys to human knowledge; the Invisible College is here to prove them wrong. • A detailed history and background of the College, including prominent members, secretive protocols, and the organization's most closely-held secrets. • New Advantages, Skills, and Backgrounds, a new Swordsman school, and rules for the sinister alchemical art of Blood Science. • New rules for creating Inventions, plus a list of new gadgets for use by your Heroes." The nation bleeds from countless wounds. Ruthless foreigners march across her soil, a terrifying Inquisition drags innocent citizens from their homes, and a boy king struggles to defend himself from secret enemies. In these dark times, the people call for a champion — and El Vago answers. He appears in the dead of night like an avenging angel of Theus. He hides his identity behind flashing swordplay and a white leather mask. He rides through the countryside with the sound of thunder, protecting those who cannot protect themselves. Every Montaigne soldier fears his name, every hateful Inquisitor whispers curses at his shadow. He is everywhere and nowhere — the soul of Castille brought to life. He is the Vagabond. In a few short years, El Vago has become the defender of an entire nation, His deeds are legend; his actions give the citizens reason to hope. But what sort of man lies behind that grinning white mask? And what sort of Heroes would pledge their lives to his cause? • A comprehensive history of the Vagabond's organization, from the promise which began it to the numerous cabals which risk everything in his name. 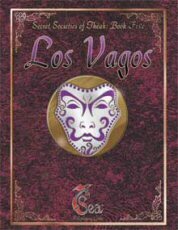 • New Swordsman Schools unique to the organization, new skills and advantages, and rules for integrating your Heroes into Los Vagos — including a complete mini-campaign! • Stats and descriptions for the heroes who ride alongside El Vago, as well as the villains who would stop at nothing to bring him down. • For the first time, the secret of El Vago's identity. 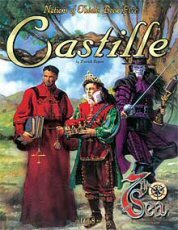 A copy of the Castille sourcebook is recommended for use with this product." "Before the time when histories were written by scholars, and myths were translated into lore, an ancient people walked a land known as Bryn Bresail. They opened passages through time and space, and stepped out among turmoil and discord - a place such as they had never known. With emotionless eyes, they watched the passions of humanity, vowing to learn... to emulate... to become. They are known as the Eternal Sidhe. Their descendants still walk among us. In her distant cave, an Oracle known as the Sophia watches the future approach in her crystal pool. Aware of events all across Theah, she maneuvers her followers to avoid an impending apocalypse. Using the magic of their Sidhe ancestors, her children must discover a way to hold back the tide of fate. They call themselves Sophia's Daughters, and if they fail, then all the machinations of all the groups of Theah will be swallowed in the destruction of the very world they seek to control. Equality and power are just the beginning. 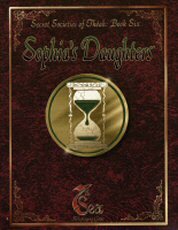 The Sophia's Daughters are here to ensure that the ending never comes. • A detailed history and background of the Daughters, including prominent members, secretive protocols, and the organization's most closely-held secrets. It also includes a history of their cousins in Bryn Bresail: the Sons of Lugh. • New Advantages, Skills, and Backgrounds, a new Swordsman school, new magic available only to the Daughters of Sophia, and rules for making magical potions." "Sixteen hundred years ago, a man stood before the Senators of Nunia and told them of a new faith. Thirteen hundred years ago, a second man preached a testament of that faith on the threshold of the Crescent Empire. Seven hundred years later, a third man called upon Theans to make war in the name of righteousness; to save themselves from Legion's Flame. These were the Prophets of Theus, the servants of Theah's God. From their words, the Vaticine Church of the Prophets was born. The Church has guided nations, been a bastion of religions belief, and safeguarded the souls of millions. Yet it has also spawned numerous rivals, crushed heresy with an iron fist, and caused cataclysmic wars. The faith of Theus grows, and through strength of will, the Vaticine Church prospers. Today, it awaits the coming of the Fourth Prophet - and its servants turn patient eyes toward an uncertain future. • A history of the Vaticine, including new details on the first three Prophets. • Expanded coverage of the dreaded Inquisition: their history, their organization, and the sinister abilities they use to eradicate heresy. • Complete details on the organization, methodology, and beliefs of the Church of the Prophets. • Thorough coverage of the Vaticine's biggest rivals: Objectionism, the Church of Avalon, and Ussuran Orthodoxy. • New rules, skills, backgrounds, and expanded details for the Faith Advantage. 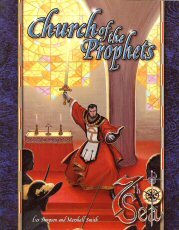 • Tips on playing members of the clergy, and ideas for integrating priest Heroes into a 7th Sea campaign. • Coverage of Theah's most important religious leaders, including all nine Vaticine Cardinals, the Archbishop of Avalon, and a fearsome member of the Knight Inquisitors."